Joseph Romm, one of Rolling Stone magazine’s top “100 Agents of Change,” has focused his talents on helping us all to increase our Language Intelligence and to better understand the art of persuasion. Romm demonstrates that you don't have to be an expert to vastly improve your ability to communicate. He has pulled together the secrets of the greatest communicators in history to show how you can apply these tools to your writing, speaking, blogging — even your Tweeting. The book also looks at the language intelligence of President Obama and Governor Romney. With a few easily digestible and memorable concepts, Language Intelligence also offers readers an indispensible roadmap for today’s political and pop culture landscape. 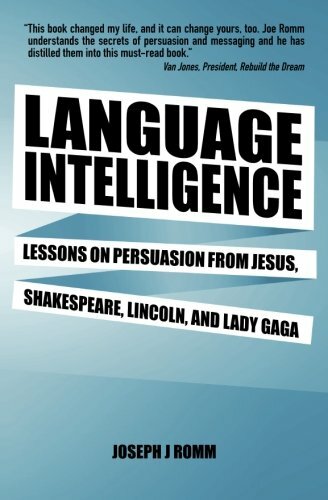 “For anyone who seeks to understand why Lady Gaga’s music has become a global phenomena or how to avoid ‘Etch-a-Sketch’ moments, this book is for you,” said Romm.